The thinking behind this project is to highlight, indeed showcase the many and varied cultures and nationalities that make up our school and town. On the night the school hall will be transformed into an International arena with stands and displays from a selection of countries from near and far e.g Poland, Croatia, Lithuania, Nigeria, Australia, UK, USA, Spain, Morocco, Scotland. 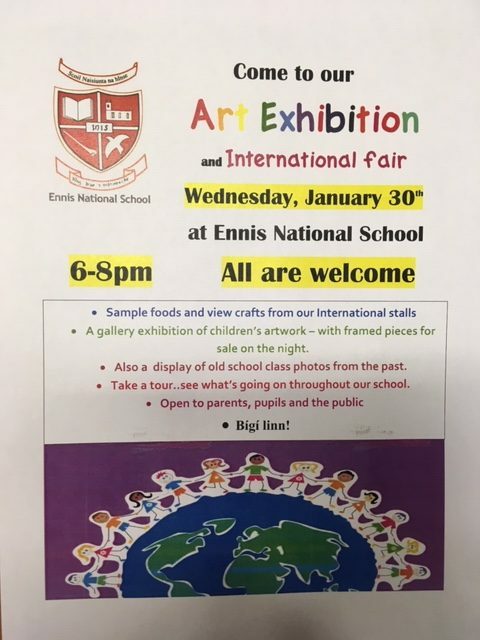 Doors will open on the night from 6pm to 8pm and it’s important to stress that the event is open to all the general public and not just the school community. Entry is free and all are most welcome! 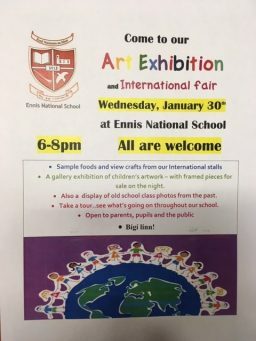 In tandem with the International stands there will also be a Whole School Art Exhibition featuring designs and creations produced by the school’s 600 plus pupils. All art pieces will be framed and available to purchase on the night. There will also be a ‘Nostalgia Corner’ on the night with a wide selection of photos and memorabilia from down the years in the ‘Nash.’ We invite past pupils to come along and take a leisurely stroll down memory lane!